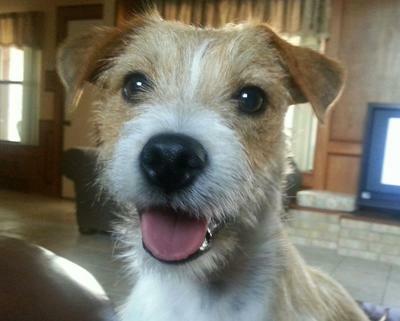 I have a 1 1/2 yr. old Jack Russell that I recently rescued from the street. I love him dearly and will not get rid of him, but I'm away from home 12 hrs. a day, 4 days a week at work. I've had to take up all the rugs, put up all the remotes, put away all the pillows, and anything else you can think of. Last night I came home and he had torn up part of my leather recliner. I have a yard, two pet doors, and all the toys you can give him. I also have two Boston Terriers for his company. I'm not there to catch him in the act. I'm desperate!! I can’t be sure about the reason behind your Jack Russell’s destructive behavior without more information, but one possibility is separation anxiety. Is he very attached to you, for instance never wanting to leave your side when you are home? These are the dogs that are at highest risk for separation anxiety. This is a common problem that can develop at any point in a dog’s life. The goal of treatment is to teach dogs to relax, reward them for doing so, and promote a healthy rather than overly dependent relationship with people. In some cases, dogs need help remaining calm in order to be more receptive to behavioral modification. Dog appeasing pheromone, over the counter anxiety-relievers (e.g., Anxitane), and prescription medications have all been used with success for separation anxiety. A veterinarian who specializes in behavior could help you get to the bottom of what is going on with your dog. If your primary care veterinarian is not in a position to help, the American College of Veterinary Behaviorists has a listing of these specialists on their website.